The Jaboticaba – what is it? In our long running saga of the ‘Jostaberry – is it worth growing?’ – a reader from Australia wrote that he preferred the Jaboticaba. And what is the Jaboticaba? John Allen our contributor from Australia now provides some answers, but it’s a fruit for warm climates. 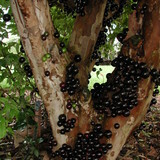 Jaboticaba is native to Brazil. In South Australia I keep mine in a shade house because summer temperatures can be over 40 degrees and winter night temperatures only get down to low single figures. In this location I have had 5 and 6 crops per year. The fruit is approximately large grape size. The skin is black when they are ripe but must be used within 4 or 5 days or they ferment in the skin. From the time of flowering to picking is approximately 1 month. The health benefits are very promising and I don’t know why more research has not been done. My wife has used them as an antibiotic with great success. They have many more applications that have not been verified as far as I know.The flesh is pleasant to eat, the skins are tough but edible and the seeds likewise. There are different varieties and the different climates have an effect on total growth. Some varieties grow into large trees others are more like shrubs. I keep trimming mine to stop it pushing through the roof of the shade house and it doesn’t object. If you prune a larger branch a whole cluster of flowers form around the edge of the cut. The flowers form anywhere on the tree. They form on new growth, older branches and even on the main trunk. The flowers form in clusters and in the right climate the fruit clusters growing up the trunk look quite unusual and dramatic. 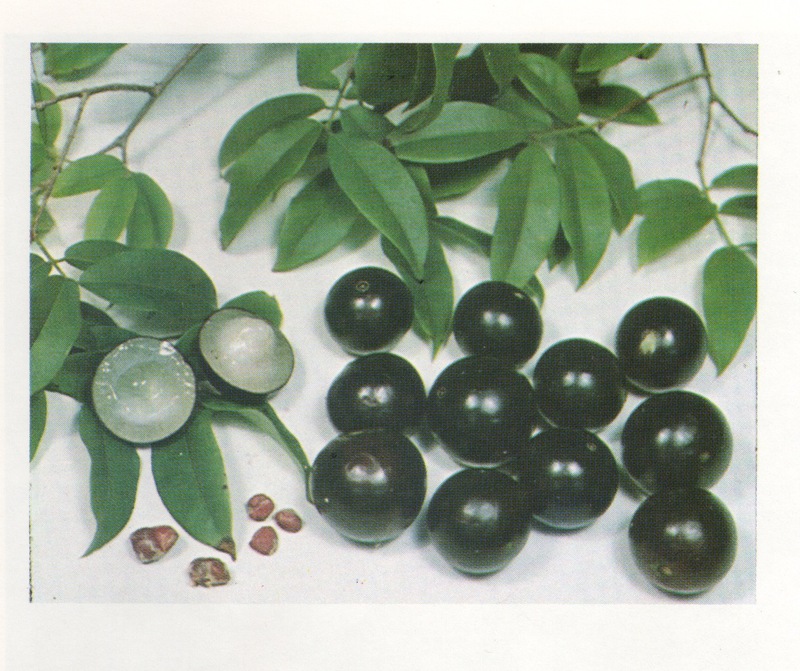 Fruit from the Jaboticaba (Myrciaria cauliflora), reproduced with permission from Morton, J. 1987. ‘Jaboticabas’. p. 371-374, in: Fruits of Warm Climates. Julia F. Morton, Miami, Florida and taken from the Center for New Crops and Plant Products, Purdue University. The full text from Morton’s book is reproduced here. I would like to try growing a tree. I have a shade house and a large glass house both 3 to 4 metres high. I’m in South Australia in Two Wells so how can I get seed or cuttings? If you look up jaboticaba on the net there are many nurseries available. I have bought them from Perry’s nursery at McLaren Vale and also from Edmonton and Rockhampton in Queensland. They can be sent by mail. They should grow well in Two Wells. Keep them well drained and the soil moist. They like moist soil but not wet feet.